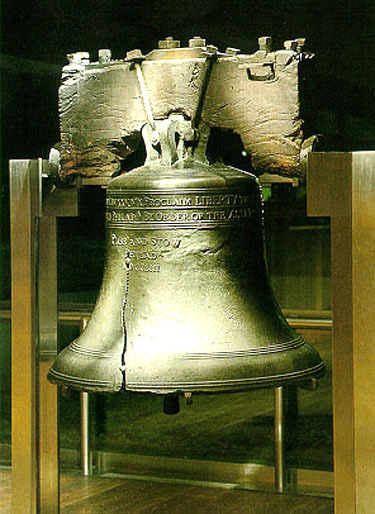 All in all I’m inclined to believe E. J. Rauch’s 1911 recollection of helping to crack the Liberty Bell in 1835. The story he told the New York Times didn’t present him as more than one of a crowd, and it didn’t come with any tidy moral. However, that wasn’t the occasion when the bell cracked; it was one of a series of occasions. Rauch recalled seeing a crack twelve to fifteen inches long. The current gap is over two feet long, and a hairline crack extends another few inches from its top. The old Independence Bell rang its last clear note on Monday last in honor of the birthday of Washington and now hangs in the great city steeple irreparably cracked and dumb. It had been cracked before but was set in order for that day by having the edges of the fracture filed so as not to vibrate against each other. . . . It gave out clear notes and loud, and appeared to be in excellent condition until noon, when it received a sort of compound fracture in a zig-zag direction through one of its sides which put it completely out of tune and left it a mere wreck of what it was. By that year, according to what he told the Times, Rauch had enlisted in the army, so he may well have been far out of hearing range. Thus, he went through life thinking he’d helped break the bell. I really enjoyed this Rauch & The Liberty Bell series, J.L.! Thank you! Agree with John. The past few posts have been intriguing. Thanks for the feedback, folks. I was intrigued by the questions this topic brought up, but it was far enough from this blog’s usual space and time that I wasn’t sure it would catch other people’s interest as well.